Countdown: 8 Days until the Launch of Transformation Camp Apollo! For 7 years Maria and Bill Phillips have been sharing an experience at their Fitness and Research Center called Transformation Camp. At 75 previous camps, people from all walks of life and from all around the world, have made the journey to Golden, Colorado to gain from the knowledge and inspiration that flows there. Hundreds of men and women have gone home from their 3-Day Transformation Camp weekend course of workouts and workshops and gone on to completely change their bodies and lives. Many people call it the best investment in themselves they have ever made. All of those previous Camps have allowed Maria and Bill Phillips to see exactly what works and what doesn’t when it comes to sustainable exercise, healthy eating, community support, and motivation. Now, the countdown is on for the Greatest Camp Ever at the Transformation Center: Camp Apollo. Much like the inspired, intellectual, and visionary quest that America put towards successfully sending a manned space flight to the moon and returning safely to earth, this camp launches a new mission: Transform the Health of our Nation by applying fitness as medicine. Only 38 participants can attend Camp Apollo in person, and their immersion experience is an unprecedented opportunity to learn, connect, and become more fired up and motivated than ever before. Camp Apollo has been fully booked and sold out well in advance. But now, there is a second best option to being there — join The Camp Apollo Virtual Experience. Learn from the experts like Hollywood Trainer Mike Ryan, Celebrity Nutritionist Keith Klein, World Famous Fitness Author and Supplement Expert Bill Phillips, Doctor of Physical Therapy to Professional Athletes, Dr. Doug Goldstein, Incredible Transformation Success Story Donn Smith and Maria Phillips, and additional experts in metabolic transformation through nutrition, exercise, hormone balance, and more. This is going to be the Greatest Fitness Camp ever not only because of the intellectual gold-mine of knowledge from the experts but also because Camp doesn’t end after the 4 days of learning. After Camp, you’ll launch into action by joining the Camp Apollo Online Support Team. Here, each day, the power of the knowledge from camp comes to life. You will join the team for 28 days of continued education from the experts! One small step at a time will become a giant leap towards your new life! A life where age doesn’t limit your achievements or abilities. A life where daily workouts and healthy meals become automatic patterns of action. A life where you get in great shape and stay in great shape. A life where you defy the gravity of your old habits, and become a new, healthier, and stronger person, from the inside out. When you sign up to attend the Camp Apollo Virtual Experience you will gain access, each day, to real time seminar footage from the experts. You’ll have a VIP view of the key presentations on nutrition, muscle building, permanent fat loss, hormone balance, skin rejuvenation, injury prevention and treatment, and perhaps most of all how to sustain the healthy changes and results that you achieve. It’s not enough to go from point A to point B. You’ve got to be able to get from Point B to Point C, which will be a breakthrough presentation on relapse prevention and sustainability for life. Getting in shape without a plan for staying in shape is like putting a man on the moon without having a plan to get him home safely. A successful mission must include a complete strategy that goes beyond anything diet programs and conventional fitness and weight loss systems have ever considered. This once in a lifetime opportunity to become part of the Camp Apollo Virtual team is only available to 38 home viewers in addition to the 38 in person attendees. If you are one of the first 15 to register as a virtual camp Apollo team member, you will receive a special gift valued at $250. This starts with your durable travel gym bag to carry all your gear for the mission. And inside, you will receive your Camp Apollo Workout Shirt, 30 Servings of modern day ‘Tang’: Strongevity Rx deluxe (the new and improved formula). You’ll also find 30 servings of Bill Phillips’ All-New PowerUP, the natural rocket fuel pre-workout supplement to take you to the next level. You’ll also receive 12 servings of RIGHT Nutrition Meal Replacements and a mixer bottle (great for inflight liquid meals). If you are one of the first 15 participants to secure your seat in the Apollo Experience, all this and more will be sent directly to you as a special FREE gift from Bill Phillips! Camp Apollo takes off with real-time coverage of the launch event, August 9th at 5PM -7PM MT. Then, on Friday, August 10th, join key-note presentations for four full hours from 1PM to 5PM MT. On Saturday, August 11th, you’ll receive 5 full hours of knowledge and incredible workout tips and routines beginning at 11AM until 4PM MT. An additional hour of bonus video will be brought to you on Sunday. August 12th from 11AM to 12PM MT. That’s 12 hours of information and inspiration, including fun new workouts and some unexpected surprises — those are top-secret, we can’t tell you about it. If you are ready to get back on track or stay the course of your own successful Transformation Journey, don’t miss this special opportunity to be a part of something Great. What you’ll learn, you will be able to put into action immediately and begin to improve your results. You will see precisely how your personal healthy change can make a big difference in the health and fitness of future generations. There are only 38 spots open for the Camp Apollo Virtual Experience, and the first 15 to register will receive a special gift from Bill Phillips valued at over $250! You can click here and reserve your spot now. Once you have reserved your spot for the event, we will contact you by e-mail within 24 hours for more information and provide instructions on how to access the real time and recorded videos and course materials. We just finished going through all the before and after pictures and stories from our 2015 Challenge. WOW! I want to congratulate everyone who started and finished — there are so many great transformations and inspiring stories from this round. Some of you have continued to build on your previous success and momentum and others have done a complete turn around and gotten back on track. I encourage everyone who participated in the 2015 Challenge to keep going strong and continue what you have started. I say it often, and it’s completely true, everybody wins in this game because the ultimate prize is having control of your body and getting your health back! Congratulations! Your change makes a difference and inspires others to improve their lives too! After deciding I needed to get back into shape, I looked up an old friend – Bill Phillips. I’d never met Bill but he has been part of my life for the past 16 years. You see, I had successfully completed a Body-for-LIFE challenge in 1999. I was the 4-Week Sprint Champion and finished in the top 10 in my category. When I looked up Bill the first thing I found was news about his knee surgeries and his subsequent transformation. After reading Bill’s story, I realized that I was in a very similar situation. I immediately knew I could do this AGAIN….even at the age of 51. I once again eagerly accepted Bill’s challenge to get back into shape. I cut out Bill’s own before and after pictures and envisioned myself making a change like that. I visualized it and focused my mind. Bill said, “If you’ve done it before, you can do it again.” It was time to take my BEFORE pictures. I was so embarrassed that I didn’t want anyone to take my picture, so I went out and bought a tripod and remote. These before pictures were even more embarrassing than I thought they would be, however they did provide a lot of motivation. I studied Bill’s Back to FIT program online. I knew that Bill had a life time of fitness and nutrition experience and all I needed to do was to “follow the directions.” I was amazed at my final transformation and for the first time I was ready to show people my BEFORE pictures….only because it was next to my AFTER pictures. At age 51, I’m now healthier, inside and out. I have a nutrition and exercise program that I can follow for the rest of my LIFE. I’m getting married to a wonderful woman in six months and I’m ready for what new opportunities await me. For anyone who might read this and be in a similar situation that I was –that even Bill Phillips was in — my heartfelt advice is don’t let age stop you from getting in the best shape of your life! Rick Lost 53 Lbs of Bodyfat and Gained 12 Lbs of Muscle! This is Rick Bullard, a 15 year active member of the Air Force, stationed in Idaho. He saw a picture of himself stepping out of the water on New Year’s Day (Polar Bear Plunge). At 250 lbs, he said he could hardly recognize himself. He made the decision to make a change and signed up for my Transformation Challenge along with his wife Amber. They traveled to my 3-day fitness camp at our center in Colorado and got connected to a supportive community of good people who were all striving to get their fitness back on track. 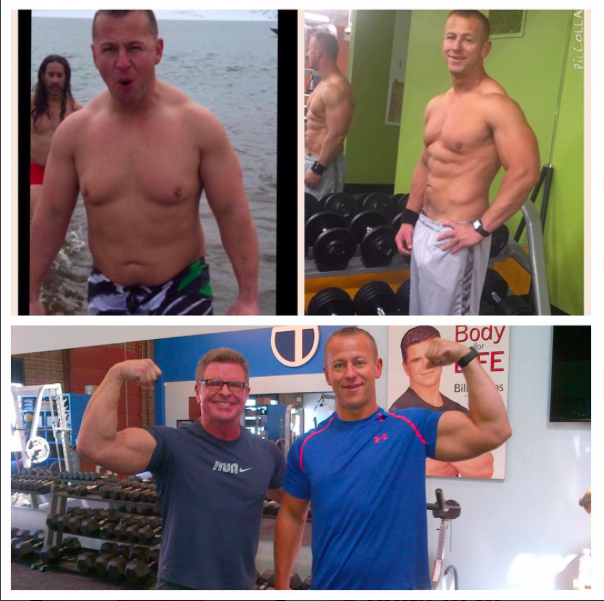 Throughout this year, Rick made steady progress by following my workouts, nutrition, and supplement plans to the T. When I saw him again last week at Transformation Camp, I could hardly believe how much he had changed. He has dropped 53 lbs of bodyfat, added 12 lbs of muscle, practically doubled his strength and there’s no doubt he has improved his heart health and mental clarity as well. We named Rick and his wife Amber, who is also active duty Air Force, as our $5,000 winners in our last contest. I look forward to sharing more about Amber and the incredible changes she has made in the near future. For now I just wanted to show you all what’s possible — Rick did it with a full time, demanding job in the Air Force, and with a busy schedule his family keeps. Rick has set new goals and is aiming to improve even more over the next 12 weeks. Q: I have a question for Bill — I used your EAS supplements and got great results when I was in my 20’s. Now I am 40 and need to lose about 35 lbs of bodyfat while I build my muscles back up. I wonder what supplements you are using these days. What can you tell me about your Right protein shakes, Strongevity Rx, and your GH10x supplements? Should I start with one of these or all of these? What do you suggest? A: What I recommend is that people approach supplementation in this order: First, make sure that you’re getting the full spectrum of essential vitamins and minerals every day. Also, make sure that your body has an ample supply of the high quality protein it needs to recover from your workouts. I get a lot of my protein and vitamins from meal replacement nutrition shakes. 24 years ago I introduced the nutrition shake MET-Rx to the fitness world and a few years later developed the EAS Myoplex line of meal replacements. Literally millions of athletes and fitness buffs have used these products to fuel their muscle performance. One of the great things about high quality nutrition shakes is that they are so rich with nutrients while still being low in calories. This makes them an ideal solution for people who want to get fit and strong while also losing unhealthy bodyfat at the same time. Myoplex was a great product in its time but today we know even more about protein science and how to filter out the highest quality, most pure protein powders and this is what I use in my new RIGHT nutrition shake. You will not find this in MET-Rx or Myoplex. 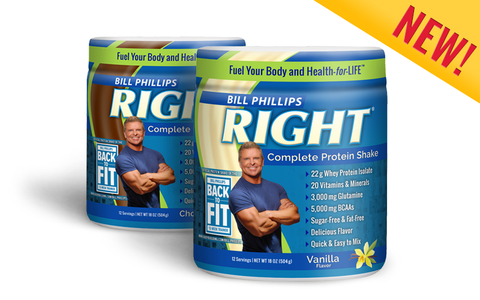 Right Complete Protein Shakes are built on state of the art nutrition science — up to date for the year 2015. Some of my previous formulas at EAS have not increased in quality over the years and the formulas have changed possibly in the opposite direction. I always recommend starting with RIGHT Complete Protein Shakes to make sure that you’ve got your essential nutrients covered. 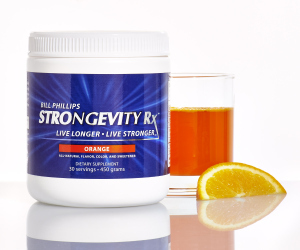 The next level of supplementation would be adding STRONGEVITY Rx to your workouts and healthy meal plan. This breakthrough formula includes the scientifically proven effective supplement micronized creatine monohydrate, ubiquinol, and ubiquinone forms for CoQ10 (which medical research has shown works synergistically and additively with creatine), and the biologically active form of Vitamin D3, called Cholecalciferol. These are three key nutrients that when taken together will increase muscle strength, mental energy, and improve recovery time. STRONGEVITY Rx is a supplement that not only helps you get better results faster from your workouts but it is also a longevity formula – studies show that these nutrients help improve both quality and quantity of life and so I especially recommend STRONGEVITY Rx to people over 40 who are working out and transforming their health. Level 3 supplementation is the next step up. This is only something for people who are already working out consistently, eating healthy, getting their protein and vitamins each day, and supplementing with the cellular energy nutrients in STRONGEVITY Rx. GH10x is that next tier product which helps our health and fitness through a different pathway. Gh10x can increase our body’s nitric oxide levels which increase blood flow to muscles and therefore help more nutrients and oxygen be delivered to hardworking cells. Gh10x also helps support the natural growth hormone response we get when we workout following a high intensity interval method. Natural Growth Hormone plays a key role in helping us lose fat and build muscle, and beyond age 40 our natural levels decline significantly. Anything we can do to boost them back up naturally can give us big benefits. Unlike synthetic growth hormone injections, natural GH boosters have no side effects and are much less expensive than the pharmaceutical products. 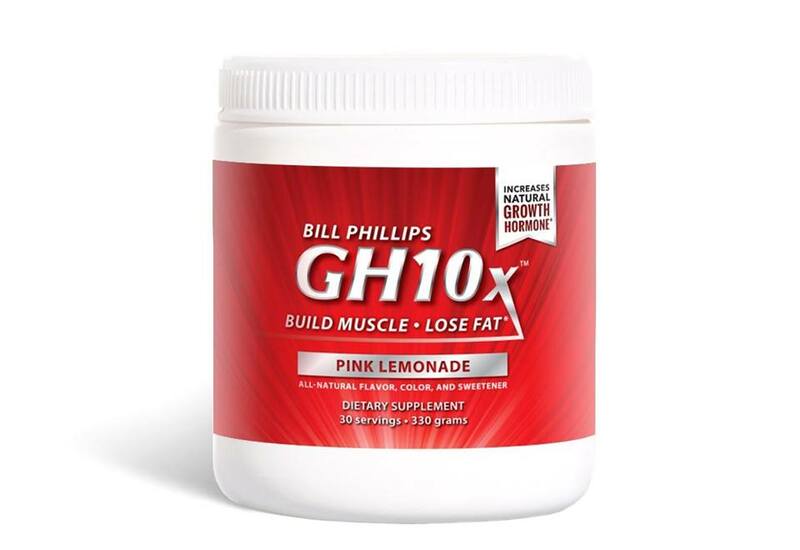 Another benefit of GH10x is that is also contains key amino acids that help volumize muscle cells which helps to give the body that firm and toned look and feel.